Let Sehin be the engaging speaker for your event! Are you looking for a high-energy and passionate speaker who shares a message that motivates and equips every attendee to start living their best life? Sehin Belew has a genuine spirit and warmth which has impacted many lives positively, and she shares her motivational message to empower people to live their best life by achieving their highest goals both personally and professionally. Many people are struggling to find success and happiness in their life, and Sehin’s presentation will motivate each audience member to uncover the principles that are needed to thrive. Her practical tips help people to develop the self-image that provides the foundational principles that lead to a better life. Her mission is to help people enjoy an extraordinary life and an extraordinary career. On stage, she explains her concepts clearly to help others see how it is possible to achieve one's dreams and live a life that is filled with contentment. Everyone who attends her talk will leave with nuggets of wisdom that will be logged in their memory to serve as a guidepost to a fulfilling life. Sehin’s life is a testimony to what having the right image and self-esteem could do. Coming from a very modest means in Ethiopia, she attributes all her success to her positive thinking. Sehin was raised by a single mother with a meager monthly pension, and she struggled with teasing and bullying as a child. As she grew older, Sehin decided that she wouldn’t let anything be a crutch to hold her back in life, so she changed her mind set to overcome poor self-esteem in order to reach higher levels of success. She rose from an insecure girl growing up in Ethiopia to an honor college graduate in the US; from a professional model to a beauty queen; from an Image & Style Consultant to an author and an accomplished Speaker. As a published author, Sehin motivates people through the written word. 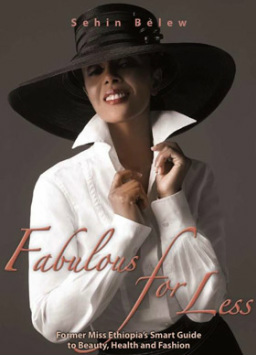 Her book, Fabulous for Less, teaches the principles of developing self-esteem to find confidence that leads to success. Sehin has delivered numerous speeches at a variety of audiences all throughout the US. She recently spoke to Stanford University's postdocs, Ph.D. students and consulting professors and it was an oversubscribed and well received event. Another recent venue was the Silicon Valley Prayer Breakfast where she addressed 750 attendees and shared the same stage with Kirk Perry, a Google president. If you are looking for a dynamic inspirational speaker for the following groups, Sehin would like to work with you. "Sehin came to speak to our postdoc, Ph.D. students and consulting professors at Stanford University. It was an oversubscribed event. She was able to empower the group and the audience absolutely loved her. Sehin shared with them insights that they can take with them for the rest of their lives. In addition, some of them enjoyed her presentation so much, they even asked if they can meet with her one-on-one after the event on future dates. Of course, as the organizer, she made me look good." "Sehin was one of our three speakers at the annual Silicon Valley Prayer Breakfast (SVPB) where we had over 700 people in attendance. She was the second of the three speakers. The other two were Neil Ahlsten, a former manager from Google who co-founded a company called Carpenter's Code, and Kirk Perry, Google president, Brand Solutions. Sehin was articulate, engaging and was well received by the crowd. The leadership committee and I were pleased by her talk and stage presence. She was just what the event needed. I highly recommend Sehin as a speaker and as a person. If you invite Sehin to speak at your event, I know that you will not be disappointed."